If you follow the latest developments in health care, you may have noticed: telehealth has taken off. Our country is focused on making health care more accessible for Americans, and naturally, telehealth has emerged as a key innovation that can help to make this a reality. It’s an effective way to deliver evidence-based medicine – and it’s something that we as physicians can embrace right now. As President and Medical Director of the world’s first telehealth practice, Online Care Group, I’m often asked a handful of common questions about telehealth. Here, I share the most common questions and my answers with readers. To me, telehealth is simple. Telehealth is a live video visit between a doctor and a patient from home or work. This differs from traditional telemedicine, which mainly connected hospital facilities to each other and relied on big, expensive hardware in clinical locations. 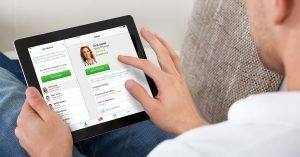 With telehealth, the patient can have a video visit with a doctor using every day consumer technologies that are becoming ubiquitous: a smartphone, tablet, or computer. There are other forms of telehealth on the market that use only phone or secure email; however, these visits do not allow for the same level of clinical patient evaluation. I have met with medical boards and associations across the country and found that live video is greatly preferred because it represents the closest interaction comparable to an in-person visit. Do patients really want to talk to a doctor virtually? For starters, let me just ask you when was the last time you shopped, banked, booked travel, made a dinner reservation, filed your taxes, or communicated with friends and family online. Chances are – if you’re like many Americans – you’ve done more than one of these things today, probably on your phone or tablet. While the health care industry has done a great job of supplying information to patients online and has even started to offer patients the opportunity to book appointments online, information and scheduling stop short of what patients want and expect from health care: quality interactions with clinicians. To date, health care ‘transactions’ have only occurred at the intersection of a physical location and the supply of available clinicians. The industry can do better. Over the last several years, a number of studies have shown that patients are rapidly warming to the concept of interacting with doctors online. Estimates suggest that half to three-quarters of Americans are interested in online consults, and I’d expect this number to grow as more patients have access to telehealth services and as more doctors offer such services to patients. If you think about the patient experience today, it’s not surprising that most folks respond so positively to the value of telehealth. Consider the national average wait time to see a doctor of 18.5 days, not to mention the excessive wait time in certain urban and rural areas. And once you’re in the doctor’s office, that wait can be long, too, which you know if you’ve ever spent two or three hours in an urgent care clinic or emergency room waiting to be seen. Retail clinics are an option, but these are generally not staffed by a doctor and are often not available outside of normal business hours. How do you examine a patient during a telehealth visit? Examining a patient through video is different from in-person, though the fundamental rules of medicine still apply. The most important elements of any consultation – online or in-person – is taking a thorough history, asking plenty of questions, and doing a visual examination. Having a video connection with a patient is really important in helping to understand the patient’s overall demeanor and level of discomfort and stress, just as in the exam room. This gives me great insight into the patient’s physical and mental well-being. In terms of a physical exam, I’ve developed protocols to help our doctors guide patients through self-exams in order to provide empirical feedback that’s useful in making certain diagnoses. One of our main tenets is that doctors must use their own clinical discretion when treating patients online. Our physicians diagnose and treat only when enough data can be ascertained in the video consultation to do so. If not, our physicians triage the patient and refer out for in-person care. That may mean seeing their doctor in-person, going to the emergency room, or ordering tests at a local health center. As with brick-and-mortar medicine, it is extremely important to protect patient health information. The information regarding a patient’s health should remain private between the physician and the patient and be stored securely, in compliance with the Health Insurance Portability and Accountability Act (HIPAA). American Well provides a secure space for patients to safely and confidentially consult with a doctor online. This is imperative for an effective and safe telehealth practice. What does telehealth have to offer me as a doctor? Telehealth is not only convenient for patients; it offers doctors flexibility at work, reliable pay, and access to new patients. And not only individual and group practices, but even large medical practices and hospitals, are starting to use telehealth to attract and retain patients and to expand their reach. By incorporating telehealth, hospitals under accountable care organization (ACO) contracts, or otherwise caring for patients under capitation, reap the financial benefits of having healthier patients. Private offices can offer open access and after-hours care or designate that a subset of visits, like medication follow-up, be managed through telehealth. Practices can also bring in other specialties virtually into their office, like certified diabetes educators, dieticians, or behavioral health specialists. Can I make money with telehealth? There is high demand from patients for urgent-care-like telehealth services. Today, physicians across the country – including those in our national telehealth practice – make a very good living practicing medicine online, providing care anywhere from 10-40 hours per week. Another option is for doctors to offer telehealth to their existing patients. In many states, doctors are already being reimbursed for services delivered to their own patients by including GT modifiers in their billing (this modifier is used to indicate telehealth services via interactive audio and video telecommunication systems). Currently 20 states mandate private payer reimbursement for telehealth services and 45 states reimburse for some telehealth services. As our doctors move from fee-for-service to capitated payment models under the Affordable Care Act, they are absorbing the risk (“rewarded for performance,” as some might say). Telehealth is one way to improve efficacy and efficiency of patient care. Telehealth lets doctors increase the number of touch points for patients, which potentially can improve outcomes as well. 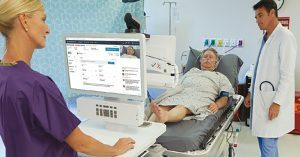 Is telehealth the future of healthcare? Telehealth isn’t really a new form of healthcare; it is the same healthcare that Americans are using every day, delivered in a faster, less expensive, more convenient way. Although not everything can be treated via telehealth, it’s a great option for many types of acute care, chronic care, behavioral health, and wellness services. Patients, doctors, hospital systems, employers, insurers, regulators, and legislators are all rapidly changing the way they view health care in order to incorporate telehealth. In the coming months, the proof that telehealth is here to stay will become even more evident. It’s time to embrace the nowof health care. If you have any questions or to learn more about where and how I practice telehealth, email me at peter.antall@americanwell.com. Dr. Antall is the Medical Director of Online Care Group, a physician-owned primary care group that offers its clinical services online using American Well’s technology. 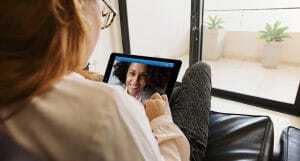 American Well’s web and mobile telehealth platform connects patients and clinicians for live, clinically meaningful visits through video, supplemented by secure text chat and phone. For more information, visit AmericanWell.com.